The last decade has been a miserable decade. As the global capitalist socio-economic system continues to seize up, and as inequality deepens both between and across nations, the Global North has been met with a reactionary nationalist backlash. This backlash has been fuelled by the common narrative that it is malevolent ‘outsiders’ that are the cause of our problems – Mexicans, European migrants, the poor, the disabled, the working class, and so on. From so-called ‘moderate’ politicians to blood-baying ethno-nationalists, the response has been to empower those calling for a resurgence of the nation-state – to put up boundaries, borders and walls and to expel all those individuals and institutions allegedly intent on benefiting at our expense. This nationalist backlash is based on a fundamental misconception – that if only it was possible to reinstate a parochial and ‘sovereign’ nation-state, it would be possible to ‘take back control’. That our collapsing wages, surging living costs, and hollowing out of social support has been a result of being ‘exposed’ to globalisation, and that if we could only reinstate some well-managed ‘good British/American/French capitalism’ then we’d all be enjoying our bread and roses. All this fails to recognise that deindustrialization, the offshoring of production, exposure to cheap imports, and the emergence of huge personal debt, are not the result of the mismanagement of the economy. To the contrary, these strategies (amongst others such as installing puppet dictatorships, ‘structurally readjusting’ trade rules, privatizing social goods and ‘financialization’) are part of an ideological response to the systemic capitalist crisis of the 1970s. These are not symptoms of a system going wrong, but rather a concerted attempt to ‘offset’ crisis and restore profitability to an ailing economic system. Those overseeing these transformations claimed that there was no alternative. This was purportedly no longer about politics, but about expert (economic) knowledge determining what was both necessary and logical. The “21st Century” – the former UK Prime Minister Tony Blair informed us – would “not be about the battle between capitalism and socialism but between the forces of progress and the forces of conservatism… within us” . This apolitical acquiescence to the ‘rules of the game’ was the supposed limit to our reality – capitalist realism, as our late comrade Mark Fisher would call it . When the 2008 financial crisis hit, the ‘expert’ solution was to underwrite the financial system, and convert it into a sovereign debt crisis. Suddenly, the toxicity of obscure financial assets – riddled with subprime mortgage IOUs that weren’t worth the paper they were written on – had become the toxicity of public spending. Rather than an opportunity for the re-emergence of politics, the response was to apply more of the same ‘expert’ and ‘apolitical’ (of course!) adjustments to our economy. The raising of university tuition fees, the slashing of the Education Maintainance Allowance, the freeze on NHS wages and the restructuring of junior doctor contracts, the closure of Sure Start centres, the recurring huge cuts to local council funding, the sell-off of public assets, the increase to VAT, and so on and so on. So we reach the 3rd June 2016, when the then UK Justice Secretary and Brexiteer Michael Gove was widely ridiculed for declaring that “people in this country had had enough of experts”. Yet the otherwise fat-tongued simpleton had got this one correct – people were sick of a political elite that had for decades proclaimed themselves as ‘experts’ presiding over a system that had left the majority of people poorer, sicker, more depressed, more scared, and less certain that the future was worth living, No clearer was this demonstrated than in the widespread rejection of the Clinton dynasty, whose failure in the 2016 US election campaign occurred despite being opposed by a misogynistic racist chauvinist fool that would soon earn the accolade of having the worst Presidential approval rating in history. And so we reach today’s potent and almost incomprehensible mix. The nation has become mobilized as both the answer and a symbolic rejection of thirty years of ‘experts’ imposing their doctrines of structural readjustments both at home and abroad. It is underpinned by an almost romantic, yet fundamentally reactionary belief, that we can somehow return to a milieu of sovereign ‘nation-states’ in charge of their own affairs, like an archipelago of little floating islands existing irrespective and without heed to the material reality of the globally interdependent economy. Yet the fallacy in all this is that there is no new political-economic model. Those ‘anti-experts’ arguing that we need to ‘take back control’ and reassert our national will are often, quite literally, the same people with the same ideas that came before. This supposedly new Glorious Nation will pride itself on lowering its corporate tax rates even further – despite the fact the UK already has the lowest corporate tax in the G20 – further enmeshing daily life into the whims of global capital. Rather than being tied through the EU into destructive trade deals such as CETA, the UK is instead desperately trying to forge its own ‘deals’ that will dismantle ecological legislation, open up the NHS to US venture capital, and sell of vast swathes of our cities to foreign investment. In short, whilst nationalist rhetoric has a very real impact in fuelling xenophobia and racism, both on the streets and in government policy, the economic policy remains one of ‘ensuring global competiveness’ – in other words, more of exactly the same political-economic approach that has defined the past three decades. Whilst some left-learning parties and politicians – such as the UK’s Labour Party under Jeremy Corbyn’s leadership, or the former Democrat presidential hopeful Bernie Sanders – promise to try and reclaim the nation-state as a more ‘humane’ institution, their strategies ultimately remain grounded in Keynesian-inspired redistributive economic logic. Whilst the rhetoric suggests these parties are part of a new leftist-strategy, the underpinning analysis remains that we can somehow return to a ‘strong’ nation-state presiding over a healthy (and controlled) capitalism that works for “the many, and not just the few”. It is without question that we’d rather see the election of national politicians that are genuinely committed to equality and social betterment, rather than neo-fascist demagogues bent on further exacerbating inequality and hate. Yet it is not contradictory to suggest that the prospect of an archipelago of strong nation-states presiding over a ‘better’ and more equal capitalism is a fallacy. Not only is this a dream that belongs to a previous century – to a particular moment in the development of the capitalist economy – it was a dream that could only be (temporarily) fulfilled for a small minority of the worlds population, nominally a white-male population residing in former colonial states that continued to benefit from the expropriation of people and resources on a global scale. The left – especially in the UK – remains without a coherent vision or a set of strategies to drive a real movement towards a world after capitalism. We need to think of a different scale for our politics, of different ways to build and exercise leverage, and of a different understanding of whom can become a ‘revolutionary subject’ – those people who, through the virtue of the position they occupy in society, are in a privileged position to change how we organize our everyday lives. This doesn’t mean rejecting all that has come before, but it means recognising the need for us to generate political strategies that make sense in a world that is organized very differently to 40, 60 or 100 years before. That certain types of political demands might be crucial in organising powerful social movements, helping us both improve material conditions whilst orientating us towards new understandings of what is possible. We’ve kept these two themes together for an important reason – different types of political strategy may be possible at different scales. We’re not excited by urban-scale politics because it’s an urban scale, just as we’re not excited about directional demands in an abstract sense. Rather, we’re interested in exploring whether the municipal scale is a unique scale through which to organize a truly internationalist – a post nationalist – revolutionary politics, and whether certain types of political demand are fundamental to realizing the potential of this scale. In what follows, we will briefly introduce what we mean by these two tendencies, and establish some of our misgivings and questions. We’re not undertaking this with a certainty that we’re correct, nor that any strategies that emerge are mutually exclusive of other political strategies. However, we’re also aware that we can’t look to anyone but ourselves to start generating forms of political activity that both overcome the unwelcome return of nationalism, and that genuinely increase the prospects for just, ecologically sound and equitable ways of organising our societies. These will necessarily be aimed at the end of capitalism and the nation-state, and towards democratically organized societies held in common. ‘Municipalism’ is both the practices of self-government by towns, cities, and city-regions – municipalities of different sizes – and any perspective that advocates for such forms of government. Taken on it’s own, municipalism appears as a politically neutral concept. It’s just as possible to advocate a municipalist strategy as a way of fuelling capitalist accumulation – which is what partially underpins the logic of the UK’s current devolution policy – as it is to advocate a municipal strategy that is based upon promoting the expansion of commons and social solidarity. At it’s most basic, a radical municipal strategy is thus one that recognizes the municipal scale – both in terms of the way that people’s lives are organized in these spaces, and the institutions that govern them – as a space of contestation. Rather than a depoliticized administrative unit ‘nestled’ under the nation-state, and thus of relatively ‘less’ political importance, a radical municipalist perspective asks whether there is unique revolutionary potential in organising at the municipal level. Various radical intellectuals have previously made the case for the municipal scale being a privileged site for revolutionary organising. Perhaps most famously, Murray Bookchin – whose ideas have become influential in Rojava –argued that ‘libertarian municipalism’ was the ‘”red button” that must be pushed if a radical movement is to open the door to the public sphere’ . The Marxist geographer David Harvey has also argued that ‘rebel cities’ will become a privileged site for revolutionary movements, sharing a perspective that the ‘right to the city’ would become a clarion call for progressive communist movements. Whilst we are interested and influenced by some of these perspectives, we are not interested in this simply as a theoretical undertaking, and do not take these perspectives as ideological programmes. Barcelona, Spain – alongside a number of Spanish cities with similar projects, Barcelona is seen as a ‘flagship’ of this new radical municipalist strategy, where the citizens platform Barcelona en Comú has implemented a number of progressive policies, not least promoting direct citizen involvement in policy development, and a participatory budgeting system to redistribute the excessive politicians wages to activist and community groups. In no case is this simply a return to an electoral strategy, only conducted on a municipal rather than a national level. Rather, it’s an openness to the idea of occupying both the squares and the institutions – of exploring how best to generate power and exercise leverage to achieve social change. Each of these examples – and others – are unique, and we don’t yet know what lessons can be drawn from these for organising a post-nationalist movement towards post-capitalism. The idea of the ‘demand’ has long been at the heart of political organising. Some demands are framed as an opposition – an end to a war, the privatization of water services, the rule of a dictator, or against the closure of a local library. Other demands are framed as a demand for something – the right to vote, the 8-hour day, equal access to healthcare, a wage-increase, or for national secession. These demands are evidently different in terms of what they immediately want to achieve, yet there are also fundamental differences in the very nature of the demands themselves. Some schools of socialist organising – most notably laid out in Trotsky’s Transitional Program – recognised certain types of ‘transitional’ demands as central to any revolutionary strategy. Premised on the idea of an intellectually immature working class and the need to establish a dictatorship of the proletariat, these demands were theorized to ‘help the masses… to find the bridge between present demand and the socialist program of the revolution’ (Trotsky 1938). As such, the ultimate aim wasn’t so much to fulfill the demands, but rather to reveal the impossibility of seemingly reasonable demands being fulfilled within capitalist society. In helping to clear the ‘false consciousness of the masses’, these demands would thus hasten the capturing of the nation-state and implementing the revolutionary plan. We agree neither with the necessity of capturing of the nation-state, nor the narrow conception of demands as simply tools for aiding the ‘transition’ to socialist rule. However, we share (at the most basic level) an understanding that ‘demands’ have concrete political effects – they help ‘create’ political identities, give expression to otherwise ‘latent’ anger, frame visions of how things could be different, and name enemies (whether that be people, processes, laws or systems). In other words, demands are interesting not only because of what’s being demanded, but because of the effects they have on the composition of social movements, the people that compose them, and what that means for making the seemingly impossible become possible. We are only introducing the idea here – and so won’t go into much depth – but we suggest instead that we need to start thinking about political demands in terms of their direction. Directional-ism is the premise that we must develop and evaluate ‘practices and processes according not to their pro- or anti-capitalist ‘essence’ but according to their beyond-capitalism dynamics’ . A directional demand must therefore ‘be capable of cognitively reorienting us far enough out of the present organization of social relations that some kind of critical distance is achieved and the political imagination of a different future is called to work’ . These are demands that, in their fulfillment and/or the struggle for their fulfillment, have a concrete effect on how we think about what is possible. Our starting point is that these two themes – of radical municipalism and directional demands – may be fundamentally linked. 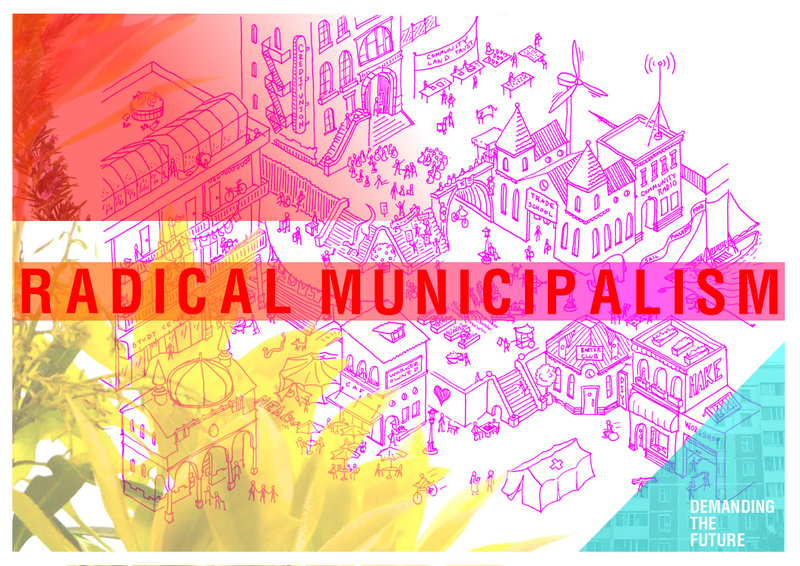 The question of “what makes municipalism radical?” might find it’s answer in the where, how and who of directional demands. In bringing these together, we’re suggesting that it’s at the municipal scale that we may find our best chance in producing ‘practices and processes’ that can really be considered as contributing to ‘beyond-capitalist dynamics’. This hypothesis immediately poses a series of questions about the challenges and/or limits of what we are suggesting. Whilst some of these may have a ‘theoretical’ response – and we’ve got some ideas – we’re more interested in seeing how these challenges are addressed in practice. If the ‘municipal’ scale is where directional demands should be made, then whom are demands made to? And who makes these demands? Where and how do those that don’t live in towns or cities fit into a political strategy that focuses on the municipal? If we accept there is a huge danger in fetishizing ‘the local’, then how does a municipal strategy resist falling into localism? How does a municipal strategy go beyond the nation-state? Are municipal institutions just an extension of the nation-state, or is it possible that they are qualitatively different in terms of what they can do and how they are positioned? Can we make qualitatively different institutions at these scales? How does ‘occupying the squares’ and ‘occupying the institutions’ work in tandem? Can we take institutions without being institutionalized? Do we even need to take the institutions? Given the ways municipal institutions are currently limited by nation-states – both financially and legally – can we produce new ways of building our capacity to act? How can we develop resources and the ability to use them without and irrespective of the nation-state? Can we build degrees of autonomy from the nation-state? How could it be possible for municipalities to seriously disobey the nation-state without being crushed? We don’t plan to answer these in the short-term, or to answer them on our own. We hope that through organising and working with other municipalist movements we can begin to develop our understanding of what works – and what doesn’t – meaning new problems and questions will continue to emerge. Some of our members are attending the Fearless Cities meeting organized by Barcelona en Comú on June 9-11th. We’ll be organising feedback meetings on whom we’ve met, and what we’ve learned. We’ll be hosting a series of discussions and workshops at the Plan C Festival, held 1st-3rd September 2017. We intend to invite those working on radical municipalist strategies to join us. We’ll look to host a UK-wide speaking tour, visiting cities across the UK to discuss what it would mean to build a radical municipal movement. We’re thinking of conducting a series of Power Structural Analyses of our cities, helping us to understand how decisions really get made in our cities, and where we can look to exercise leverage. Through these activites, we’re looking to actively network together organisations interested in developing radical municipal strategies, learning from groups that already exist, and helping share lessons across cities. We’re hoping to organize a major gathering in 2018, which we hope will contribute to fomenting a radical municipalist strategy within UK cities. If our friends agree, we hope this will include participants from across Europe and beyond. Writing in 1967 Robert Dahl, the then professor of political science at Yale University, suggested that ‘with each passing day it grows more reasonable to see the nation-state as a transitory historic form, to foresee that the nation-state will some day cease to exist as an autonomous unit… [However,] it will be generations before peoples have defined themselves and have arrived at that state of confident nation-hood where it becomes possible to imagine, without panic, the decline and supercession of the nation’ . Fifty years on, we can no longer wait for this moment – we must develop means and methods of organising our societies that hastens the decline and the supercession of both capitalism and the nation-state.